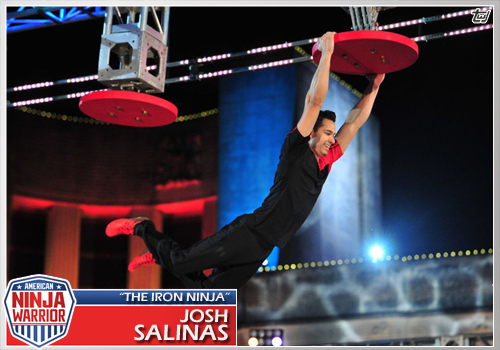 Another finisher in the Dallas City Finals was “The Iron Ninja Josh.” Salinas is in his second season on American Ninja Warrior. He advanced to Stage 2 of the Las Vegas Finals last season, falling during Wingnut Alley, the fifth obstacle on the course. You can connect with Flip Rodriguez on Instagram. Watch American Ninja Warrior on Hulu or Amazon Prime. Do you want to become a Ninja Warrior? Check out the recently published Become an American Ninja Warrior: The Ultimate Insider’s Guide. DISCLAIMER: These cards are not for sale. They are not even printed. They exist only in digital form on this blog. 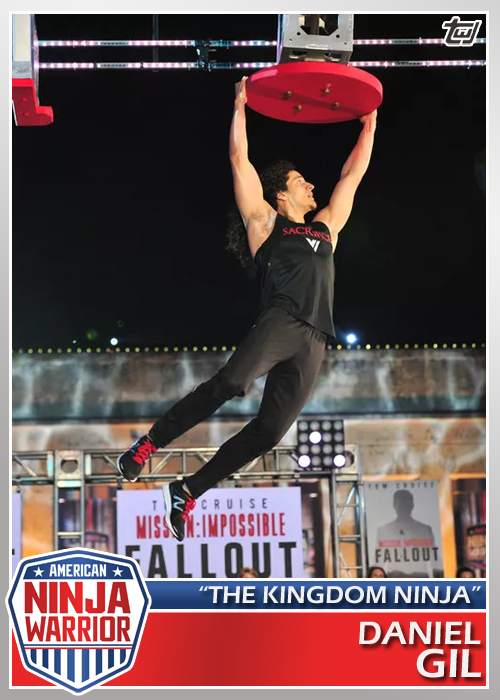 Daniel Gil, “The Kingdom Ninja,” completed the course in the Dallas City Finals and is headed to the Las Vegas Finals Stage 1. He had the fastest finish of the night at 3 minutes and 54 seconds. Only five competitors finished the course in Dallas. This is the fourth time in as many seasons that Gil has advanced to Las Vegas. You can connect with Daniel Gil on Facebook, Twitter, and Instagram. How about some horizontal American Ninja Warrior action? 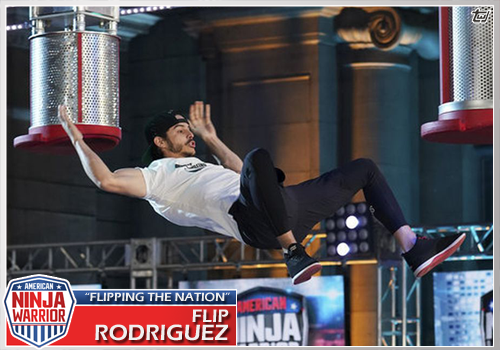 Flip Rodriguez competed in season 5 and seasons 7-10 of American Ninja Warrior. He doesn’t have a “Ninja” nickname like many of the other competitors. He is usually one of the quickest athletes to run the course. You can connect with Flip Rodriguez on Facebook, Twitter, and Instagram. You can purchase Flip Rodriguez merchandise here. Last year while on vacation, I was flipping through the channels at the hotel late at night. I landed on a marathon of American Ninja Warrior. I had never watched the show before but quickly became enthralled with the obstacle courses and the athleticism of the competitors. After we returned home from vacation, I caught up on the current season on Hulu and impatiently waited from week to week for a new episode. I was hooked. I’m an American Ninja Warrior fanatic. 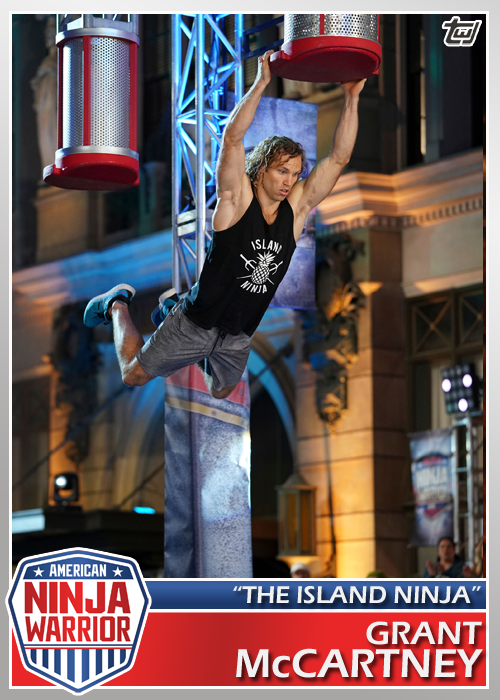 I started with Grant McCartney, “The Island Ninja,” because he is one of my favorite competitors. He always seems to genuinely have fun running the courses and has a positive attitude, even when he comes up short. You can catch “The Island Ninja” on Twitter and Instagram, or grab some Island Ninja swag here. 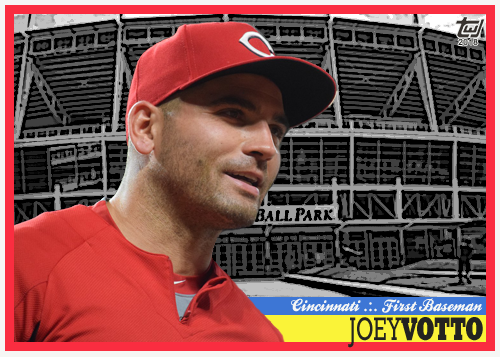 Joey Votto was named to the National League All-Star team for the 6th time. He will join first-timers Scooter Gennett and Eugenio Suarez as the Reds’ representatives in Washington DC on July 17. As bad as the season started, Cincinnati has really started turning it around. The bullpen is better than expected, and the starters aren’t half bad either. Hopefully the Reds can move Matt Harvey for some MLB-ready talent and start off 2019 on the right foot. 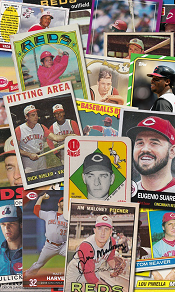 The Reds went on an absolute tear this past week, winning six straight games and catching the attention of awards-giver-outers. 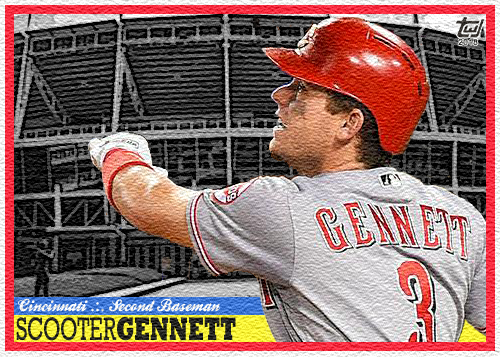 Second baseman Scooter Gennett was named the NL Player of the Week for May 7-13, hitting .591 with four homers and 10 RBI. I decided to resurrect this design I toyed with earlier this year. It’s kind of a pain to outline the player, so it won’t be used often. The Reds’ bullpen was also honored this week. The bullpen that I have been criticizing all year combined for a 0.95 ERA and struck out 32 batters from May 7-13. I still don’t like relief pitchers. 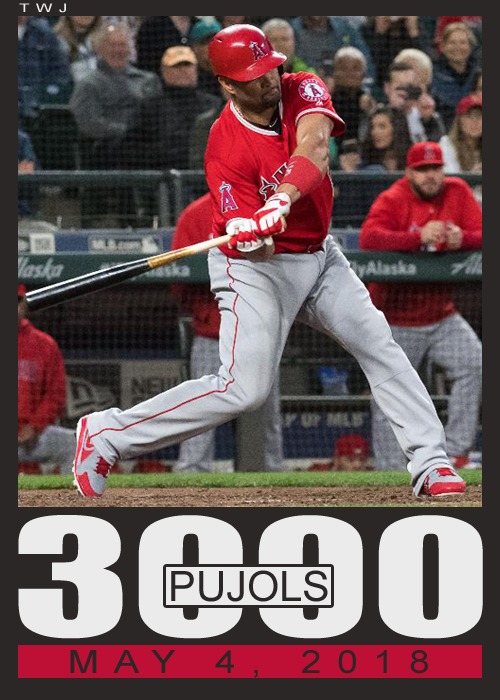 Albert Pujols became the 32nd major leaguer to collect 3000 hits in a career, joining an esteemed list of individuals such as Ty Cobb, Hank Aaron, Willie Mays, and Ichiro Suzuki. He is one of only two active players in the 3000 hit club; Adrian Beltre reached the milestone last July. The only retired members of the 3000 hit club who are not in the Hall of Fame are Pete Rose (permanently banned), Derek Jeter (not eligible until 2020), Alex Rodriguez (not yet eligible and steroid issues), Ichiro Suzuki (not yet eligible), and Rafael Palmeiro (steroid issues). 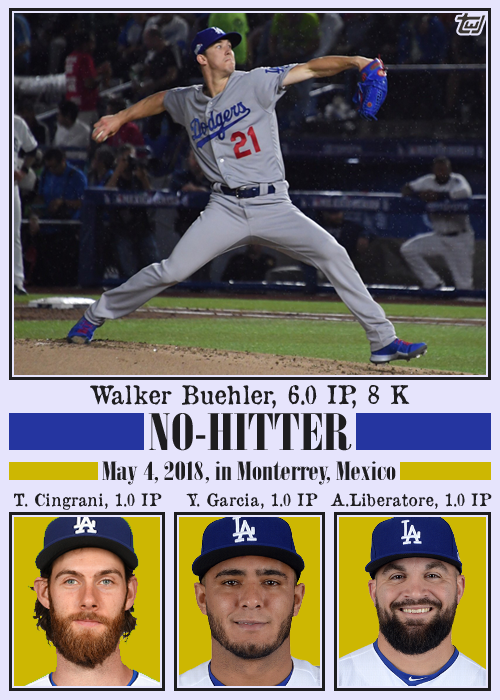 Congratulations Walker Buehler, et al. 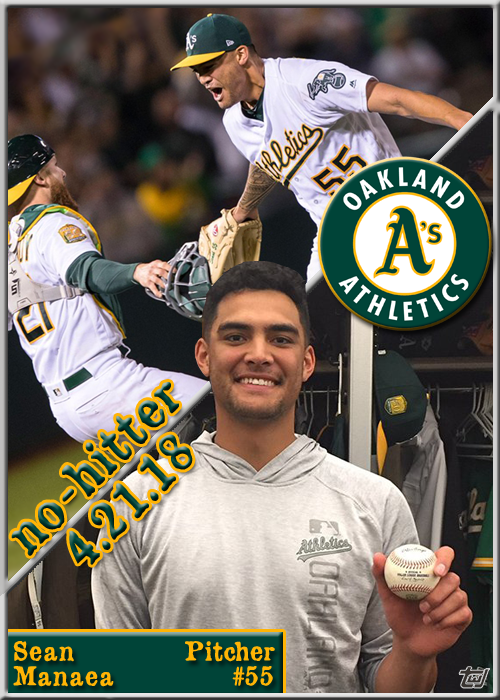 Sean Manaea pitched the first no-hitter of the 2018 season last night against the Boston Red Sox. 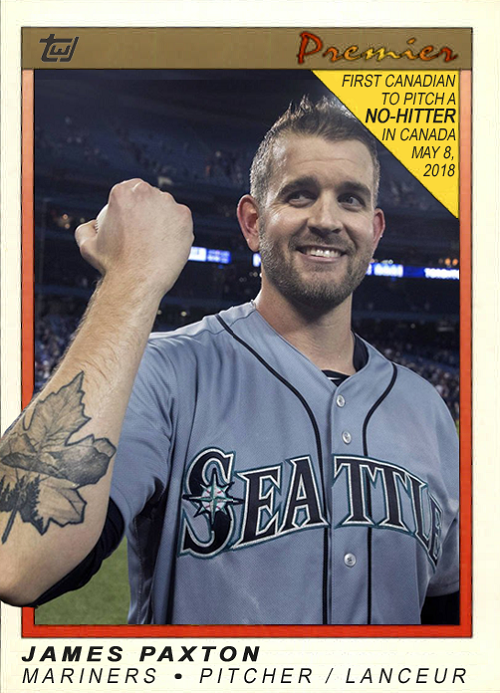 He struck out ten batters and only walked two. Marcus Semien score all three Oakland runs, crossing the plate after doubles by Jed Lowrie in the first inning and Stephen Piscotty in the third, and hitting a solo home run in the fifth.